All transactions are safe and secure with a reliable history in online purchasing behind each of our associates. Buy the Future Hiro t-shirt to own Heroes clothing and merchandise. 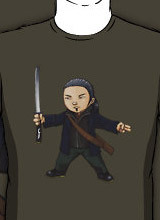 This piece of Heroes apparel features Hiro with his Helix Sword. Wear it as you repeat the Hiro Nakamura "Yatta" quote from the Heroes TV show. Yatta is the short form of the Japanese word "yarimashita", which translates to "I did it!" Hiro (Masi Oka) opens his arms and exclaims "Yatta!" after successfully teleporting to Times Square, Manhattan. The character design on this Heroes t-shirt is a trendy tribute to Hiro and his sword. Pick up yours today and don't be afraid to scream "Yatta!" the next time you accomplish a difficult task. In addition to the Future Hiro tee above, browse the Heroes Clothing Gallery for more apparel like men's and women's clothes, kids shirts or hoodies.